The counterpart of a deep appreciation and respect for fossils is a hands-on knowledge of the geologic formations that produce them. 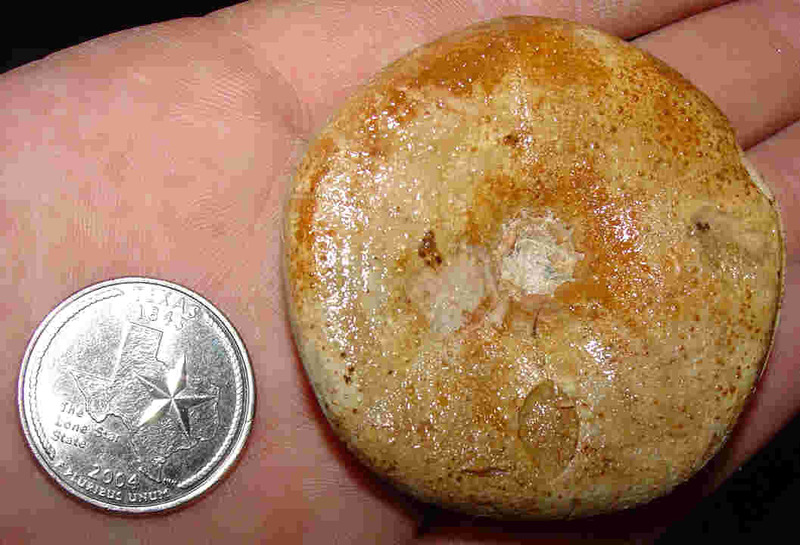 The San Antonio, Texas area is conveniently located directly straddling the Balcones Fault line, affording amateur and professional geologists and paleontologists alike the opportunity to view, up close, a succession of Cretaceous marine formations within a day or two of self guided adventure. 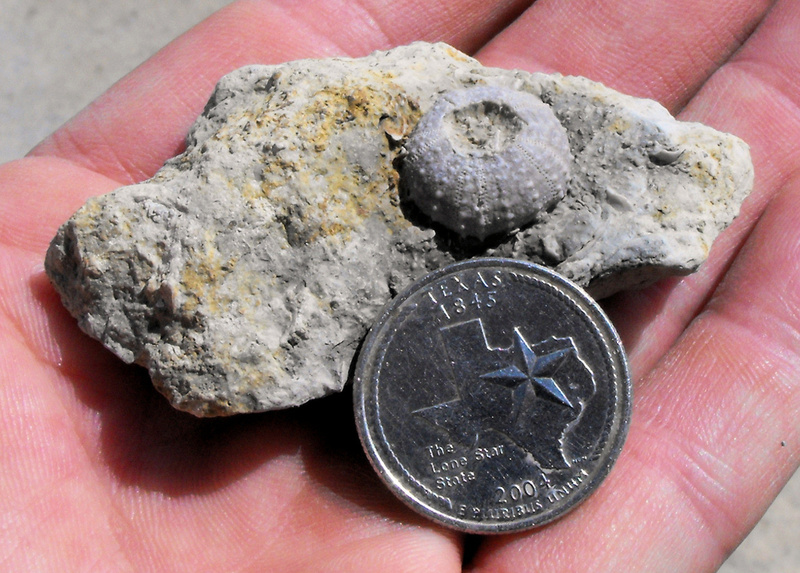 Although geologic exposures of interest still abound in Bexar County, excellent fossil bearing exposures seem to be consumed by construction faster than new ones are being revealed as compared to 5-10 years ago. Several factors contribute to this trend. 1. Economic upturn equates to accelerated construction schedules. 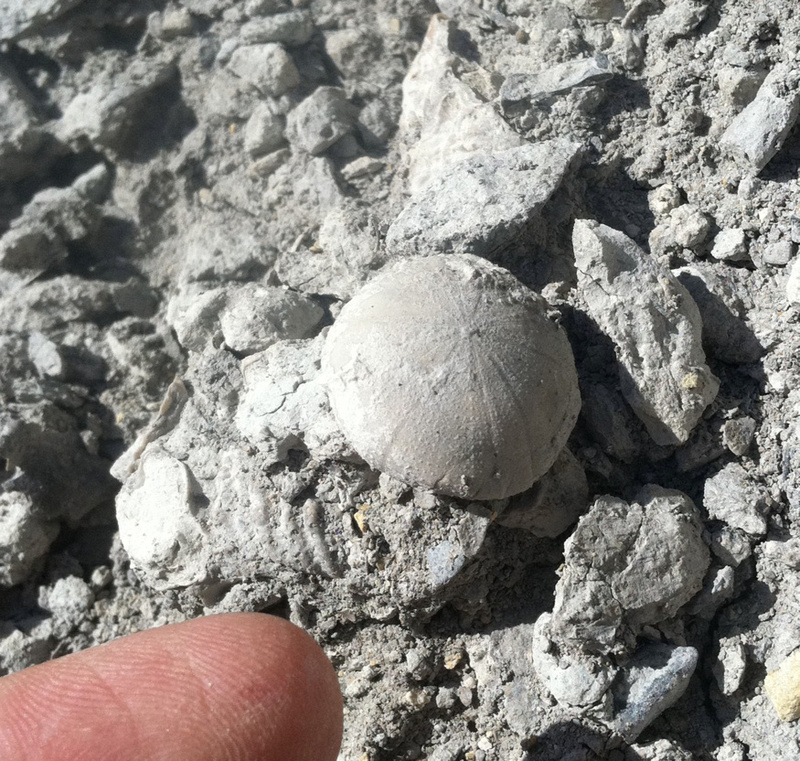 For the fossil hunter, this means that new sites are graded and built over before there is time for newly exposed rock to weather sufficiently for optimal collecting. 2. 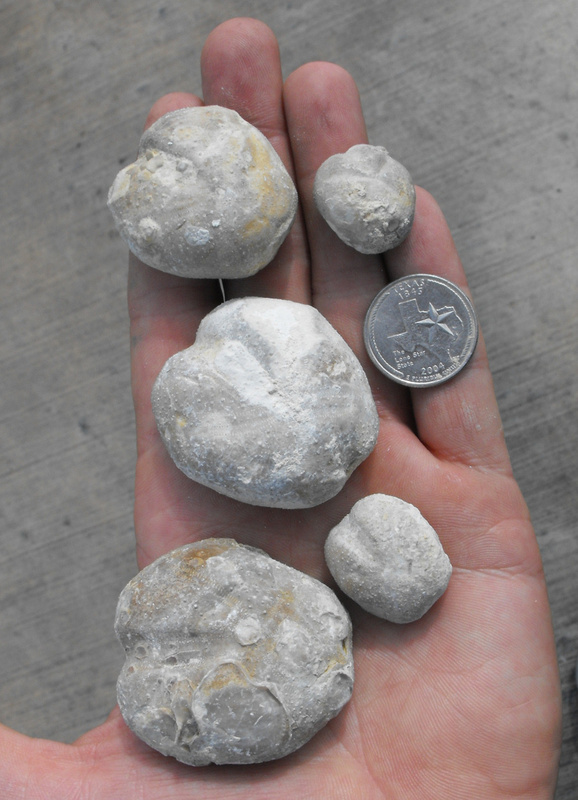 Compared to the construction in other areas, such as the DFW area, construction crews in San Antonio seem to have a stronger propensity to grind rocks into powder rather than pile up boulders which could expose fossils. 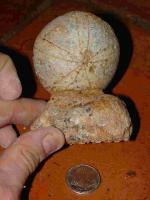 Perhaps that is due to frequent dealings with some of the harder formations, such as Austin, Edwards or Buda. 3. Due to the increasingly litigious trend of modern society, more construction sites are now fenced, posted, and monitored by security personnel and/or cameras. 4. While establishment of greenway parks along many of the major waterways in is a boon for many groups of outdoor enthusiasts, prohibitive rules and signage make these traditionally collectible areas off limits to the avocational collector. 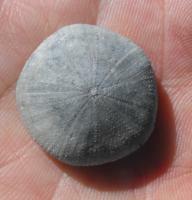 All that being said, the purpose of this guide is not so much to publicly reveal important fossil sites, which would subsequently become rapidly depleted, but rather to give the motivated neophyte a starting point that could, through perseverance, pioneering spirit and individual achievement, result in discovery of new and productive collecting sites. 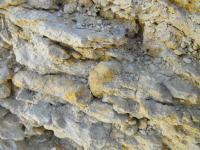 But it all starts with a working knowledge of local geology. 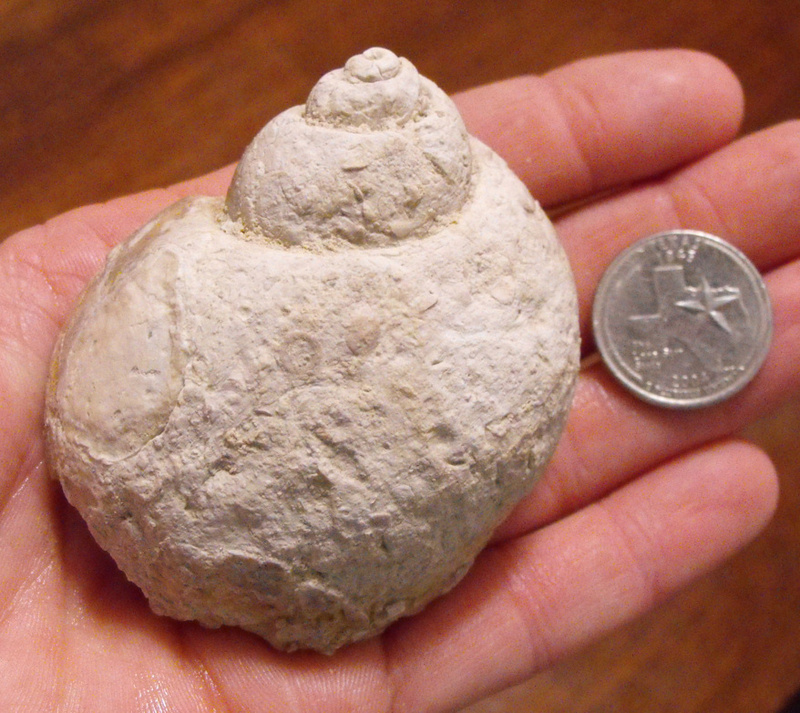 (And don't worry...some cool fossil sites will still be mentioned). Had I had this sort of information in hand back when I began my personal field explorations 13 years ago, I would have saved countless hours and miles in figuring out where to look, and what I was looking at. The sites detailed in this discussion are intended to provide an educational, up close, hands-on familiarity of each formation from a geological and lithological standpoint. 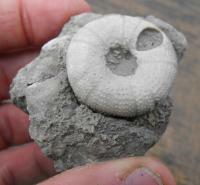 Fossils are present or abundant at some of these sites, but special effort has been made to avoid revealing scientifically significant sites under study, and also to avoid openly sharing with the internet community any personal sites found through the diligence of other hard working private collectors. With perseverance and investment come a respect for the hard work of others. 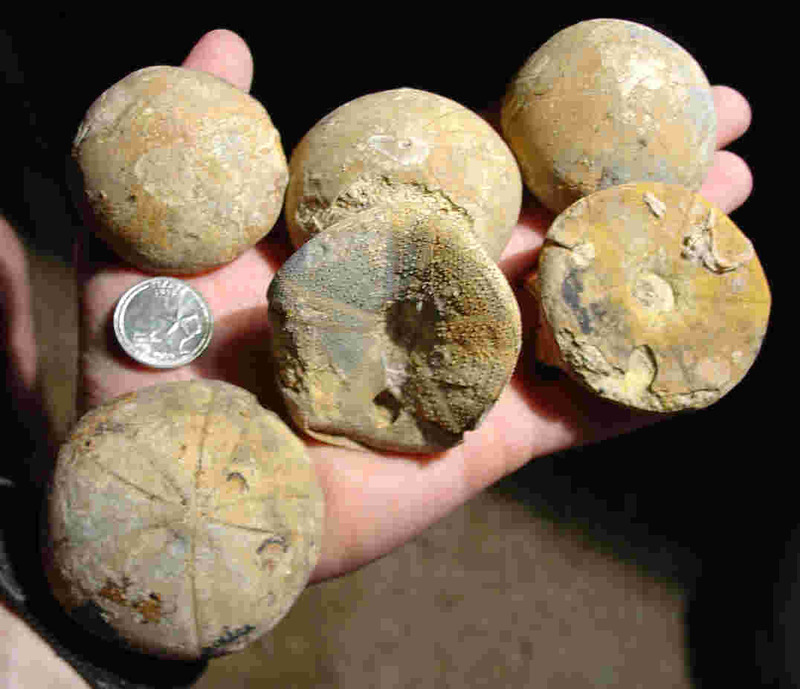 Fossils shown at the end of each section are a combination of specimens found at the specific site detailed herein, and fossils that the motivated collector may find when investigating the myriad, ephemeral sites that pop up and disappear around town over time. Aerial images were borrowed from Google Earth, and most of the ground level, roadside exposure images were taken from Google Streetview. NOTE 1: I’ll continue to make additions to this guide as time allows until the dozen or so prominent Cretaceous formations are detailed. NOTE 2: If any portion of the content seems to be in error, I encourage PMs to bring necessary updates to my attention.  NOTE 3: If you have questions about a site you've found, feel free to PM me. 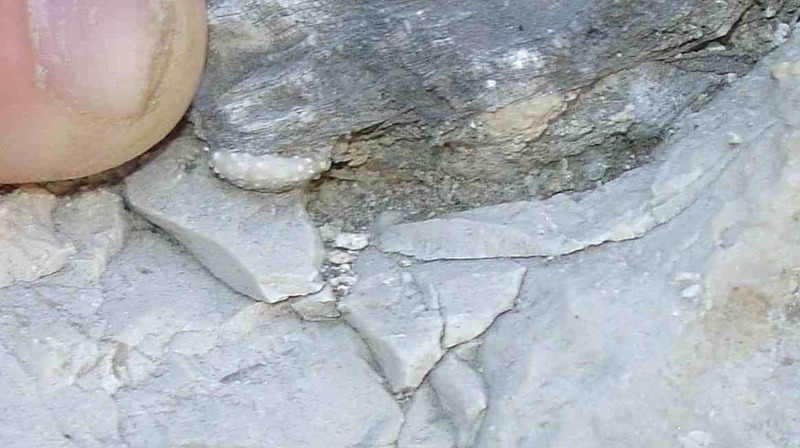 Geology: Alternating gray to yellow limestones, dolomite and marls denote marine transgressions (coastline moving inshore) and regressions (coastline moving offshore), respectively. 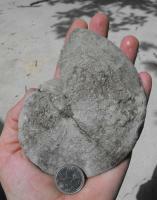 Mostly marine sediments, although some shoreline/ lagoonal deposits are marked by dinosaur tracks and plant fragments. Alternating resistant and recessive layers create stair step topography. 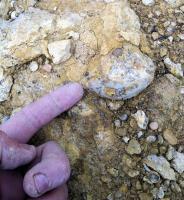 Lower unit generally thicker bedded and more fossiliferous than hypersaline upper unit. Area Exposures: This formation has far ranging aerial outcrop west of the I-35 corridor beginning in North Texas, continuing west of Austin to a point north of San Antonio, where it continues west well north of Hwy 90 all the way out to the Big Bend area. Exposures are present in far northern Bexar County along Hwy 281, about 2 miles south of Cibolo Creek, with increasing prominence heading north on 281 through Comal County. One site that has been well known since at least the 1950s, is still well exposed, and continues to produce fossils after hard rains, despite high collecting pressure from individuals as well as groups of up to 300 people at once is the road cut on the east side of 281 about 1 mile north of the intersection with Hwy 46. 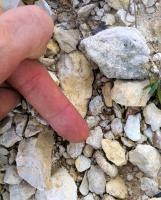 There is a recessive marl zone about half way up the road cut that is several feet thick and sandwiched between harder limestone benches above and below This cut is known by geologists to expose the Corbula marker bed, named after the small bivalve used to delineate the upper from lower unites of the Glen Rose Formation. Clearly the site is no big secret if the Google camera catches a collector there, applying his craft! 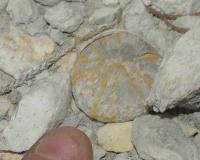 Fossil collectors are quite fond of the collectible fauna of well preserved macrofossils abundant in this zone, as described below. Paleontology: Although random searches of the Glen Rose Formation tend to turn up mostly bivalves such as Arctica, Liopistha, Neithea as well as a host of gastropods including Tylostoma and others, the Glen Rose is perhaps best known for its dinosaur bones in North Texas as well as its dinosaur tracks and echinoid fauna in South Texas. Fluctuations of sea level during Glen Rose times resulted in marine as well as shoreline/lagoonal deposits, the former preserving marine fossils, and the latter preserving dinosaur tracks created on mud flats. 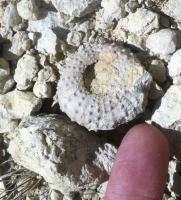 Echinoid zones are present in both the upper and lower Glen Rose, concentrated in several discrete zones. 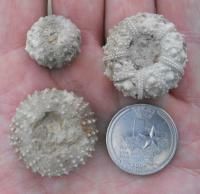 Upper Glen Rose echinoid zones tend to be dominated by the dime to nickel sized regular echinoid Loriolia rosana, and the lower Glen Rose contains a zone of highly sought after, exotic echinoids, but most collectors become enamored with the Leptosalenia texana and other echinoids found just a few feet below the Corbula marker bed for their quality, quantity, and size. This zone is marked by a grainstone at the top of the lower limestone bench, and a thin layer of slender, spiral gastropods of the genus Nerinea at the top, and innumerable round, flat foraminifera (single celled microfossils) named Orbitolina texana, in the interceding marl bed. 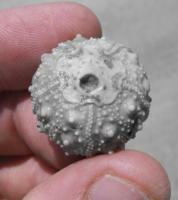 Leptosalenia texana is the flagship echinoid of this zone, highly sought after for its size, ornamentation, and common occurrence within this specific zone. The thickness of the test (shell) often leads to good preservation of this species. 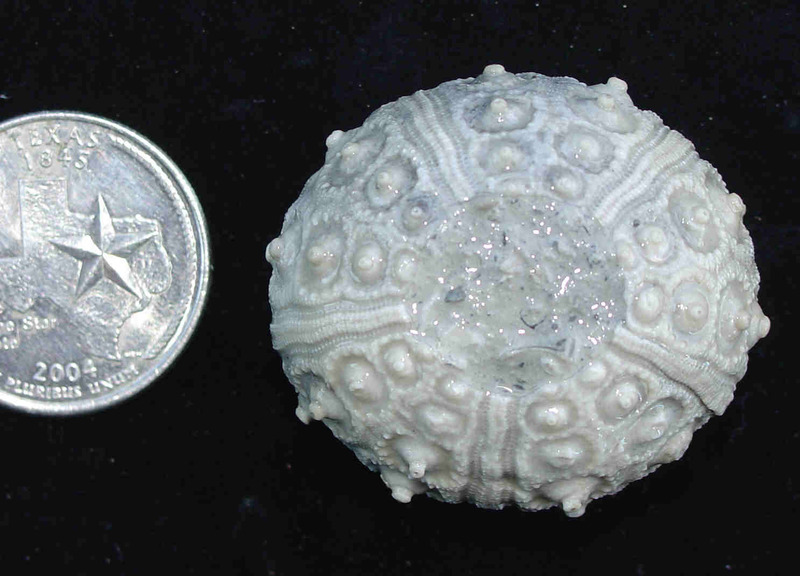 Other regular echinoids such Tetragramma and Paracidaris texanus are rare prizes from this zone and valued in any condition. Irregular (heart shaped) urchins, known collectively as spatangoids, are dominated in the L. texana zone by two species: Heteraster obliquatus (depressed unpaired ambulacrum), and to a lesser extent, Pliotoxaster comanchei (all 5 ambs depressed). 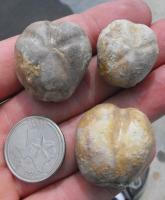 The spatangoids have a thinner test than L. texana, and are thus prone to distortion and weathering to the extent that some sites may only produce 1 well preserved spatangoid per 30-50 flawed examples. 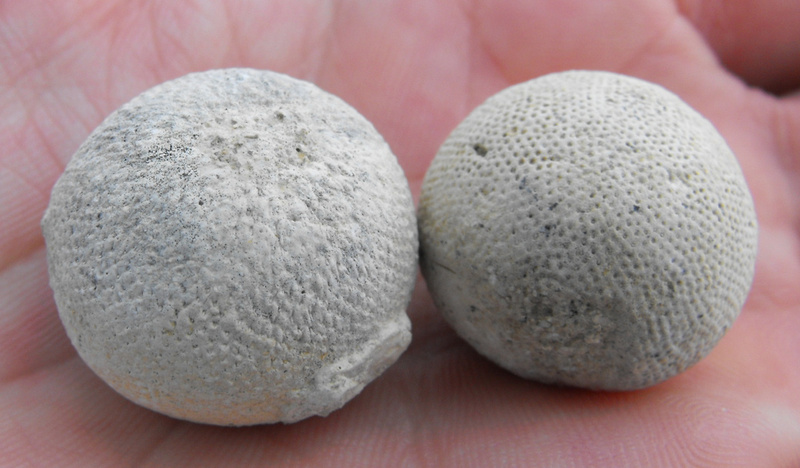 Dome shaped echinoids Coenholectypus planatus, radially symmetric at a glance, but technically irregular echinoids due to periproct (excretory orifice) placement, are also found in small numbers in this zone. 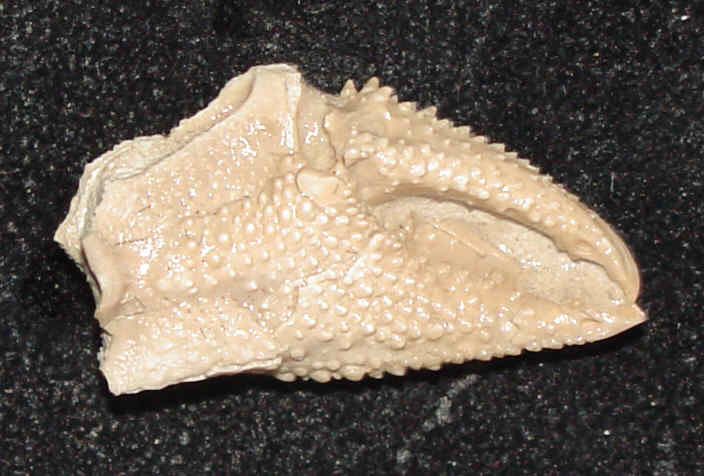 L. texana in matrix. Note small disk shaped forams Orbitolina texana in matrix. First, the spatangoids. Heteraster obliquatus has a depressed unpaired ambulacrum. 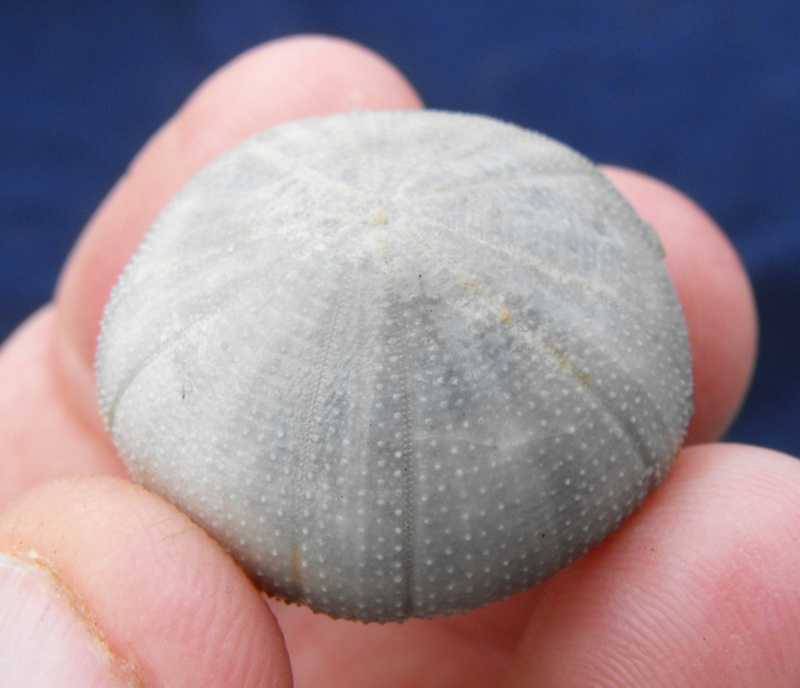 Pliotoxaster comanchei has all 5 ambulacra depressed. 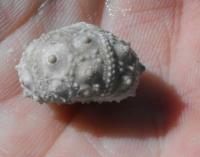 I don't spend much time collecting or studying these classes of mollusks, so this section is limited. 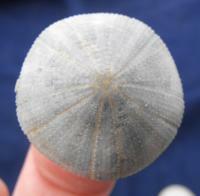 Geology: Gray to yellow limestone, marl and dolomite, nodular at certain levels, generally mapped undivided with the Edwards Group, considered by some as the basal nodular member of the Edwards. Gradational contact with the underlying Glen Rose Formation. 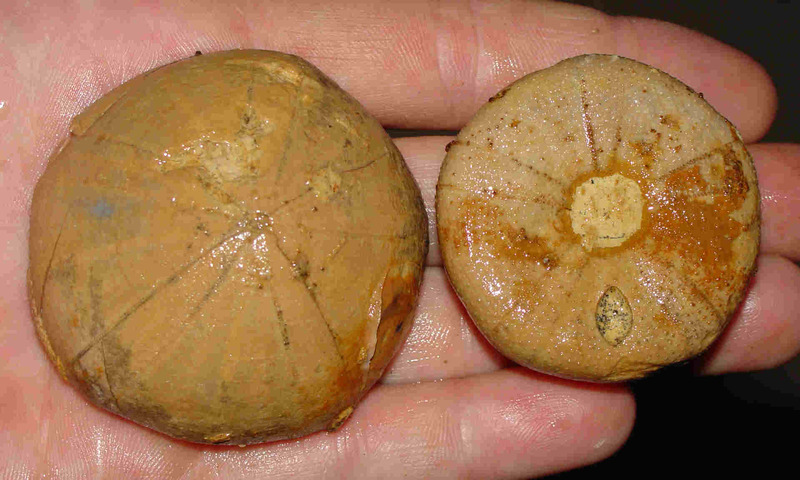 The Walnut is thought to reflect normal marine to brackish water deposits. 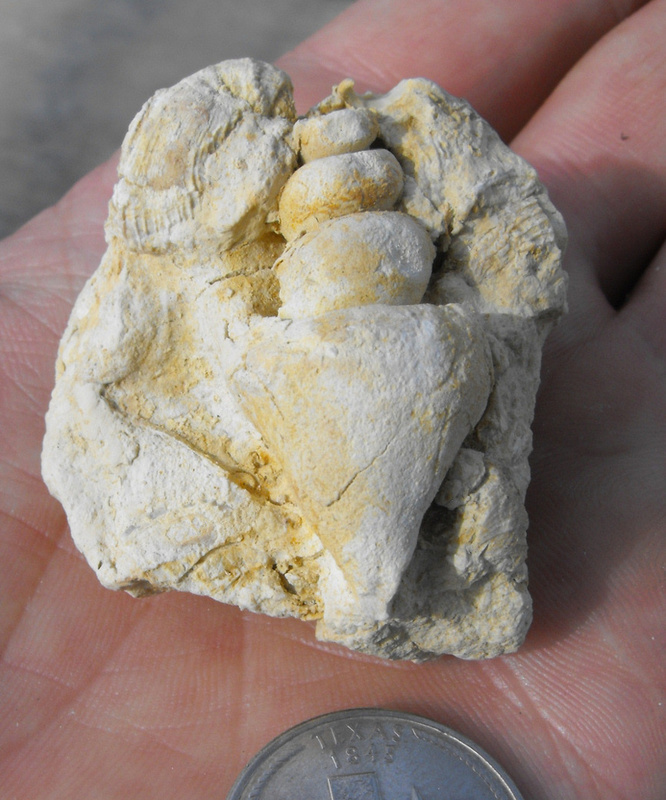 Bull Creek and overlying Bee Cave Marl members of the Walnut may both be represented in South Texas, the Bee Cave being the more fossiliferous of the two. 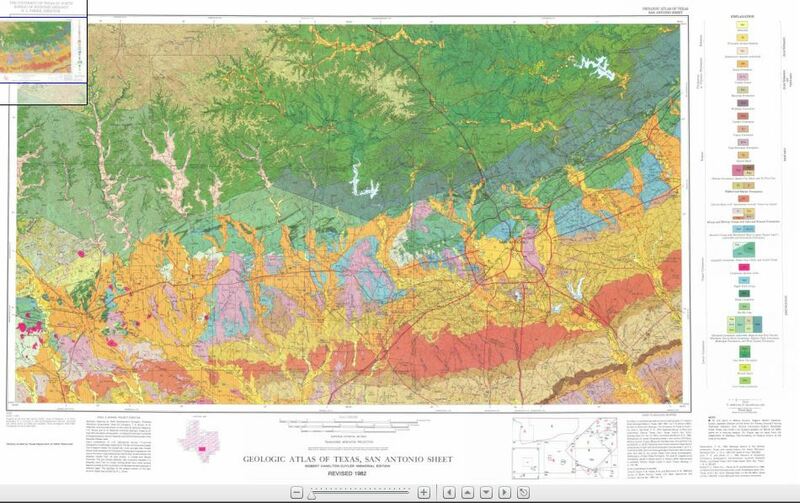 Area Exposures: I don’t know of a publicly accessible locality close to San Antonio, but a motivated enthusiast could find this zone by searching the extensive mapped contact between the Glen Rose and Edwards Formations, as the Walnut does not have sufficient aerial exposure to warrant separate mapping at the 1:250,000 map scale utilized in the Atlas of Texas series San Antonio Sheet. I’ve seen other maps at 1:100,000 scale, however, which map the Walnut separately, with the caveat that these thin ribbons of outcrop are inferred and largely subsurface. 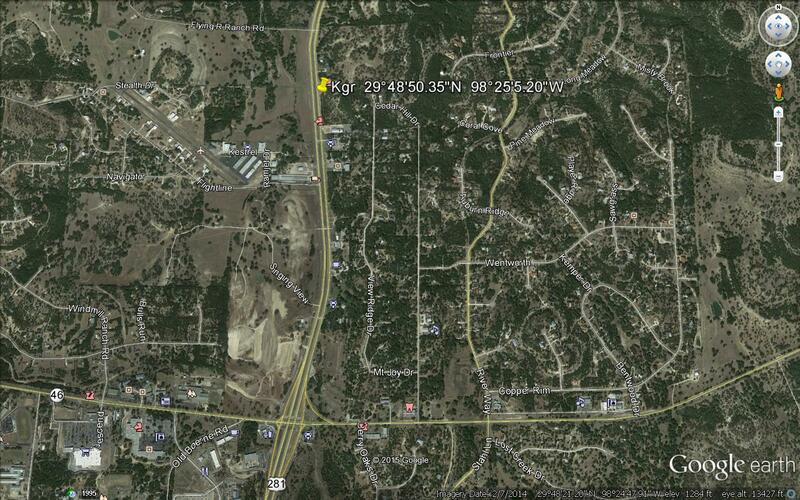 The Walnut should, in theory, be exposed in the road cuts along Hwy 281 north of town, specifically about 2 miles south of Cibolo Creek where the geo map shows the contact between the Ked and Kgr. 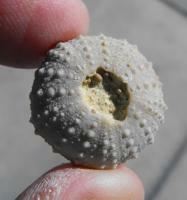 I have not investigated this area and leave further study to more industrious collectors. Paleontology: While the Walnut may be tens of feet thick, I tend to focus on a recessive, nodular marl zone about 2-4 feet thick, which I believe to be equivalent of the Bee Cave Marl of Central Texas. 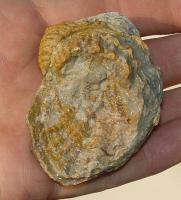 The index fossil is the distinctive oyster Ceratostrean texanum, quite abundant in this zone. 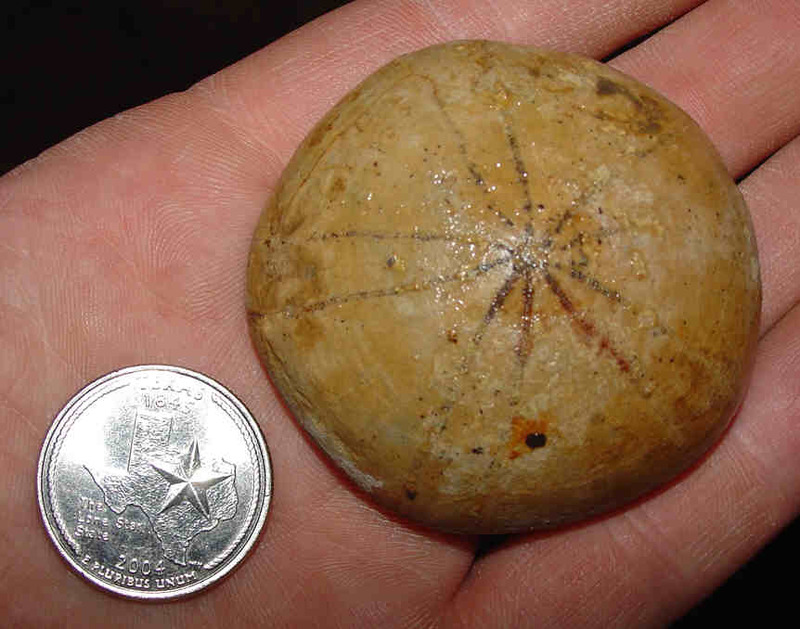 But the fossils I focus on are well preserved echinoids, listed in descending order of occurrence: Coenholectypus planatus, Heteraster texanus, Loriolia sp., Phymosoma texanum. On rare occasions I’ve found fish vertebrae and complete ammonites Engonoceras c.f. 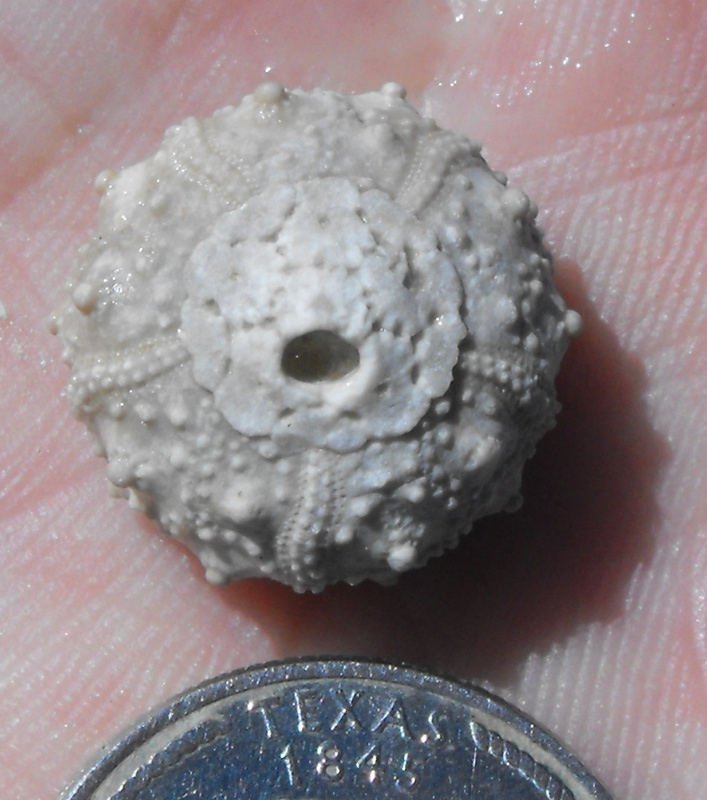 pierdenale, with fragments thereof being much more common. 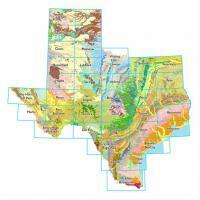 Geology: The Edwards Group of South Texas correlates with the Goodland Formation of North Texas, although they are lithologically quite different. 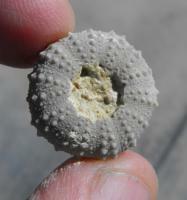 Kainer Fm: Cyclic subtidal to tidal flat limestone and dolomite. Wackestones and packstones in lower part of this unit, localized leached evaporate and breccia in middle part of the unit, grainstones and packstones in upper part of unit. 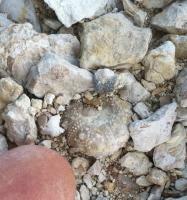 Honeycomb and variable amounts of chert nodules common. Person Fm: Shallow subtidal to tidal flat cyclic limestone and dolomite. Recrystallized dolomitic limestone, argillaceous limestone, leached and collapsed zones (some infilled with red “terra rosa” clay), interconnected honeycomb porosity, vuggy intervals, chert locally abundant. The lowest 20-30 feet of this unit, the Regional Dense Member, is thought to correlate to the Kiamichi Fm of North Texas. Area Exposures: The Edwards is perhaps the best exposed limestone unit in Bexar County in part due to its resistance to weathering. More important than its paleontology, this is the primary local building stone, and its honeycombed subterranean catacombs comprise the primary aquifer for the San Antonio area. My house is built out of Edwards limestone, and the Edwards also provides my house with a very stable foundation that is not subject to shifting, as can happen in softer formations. 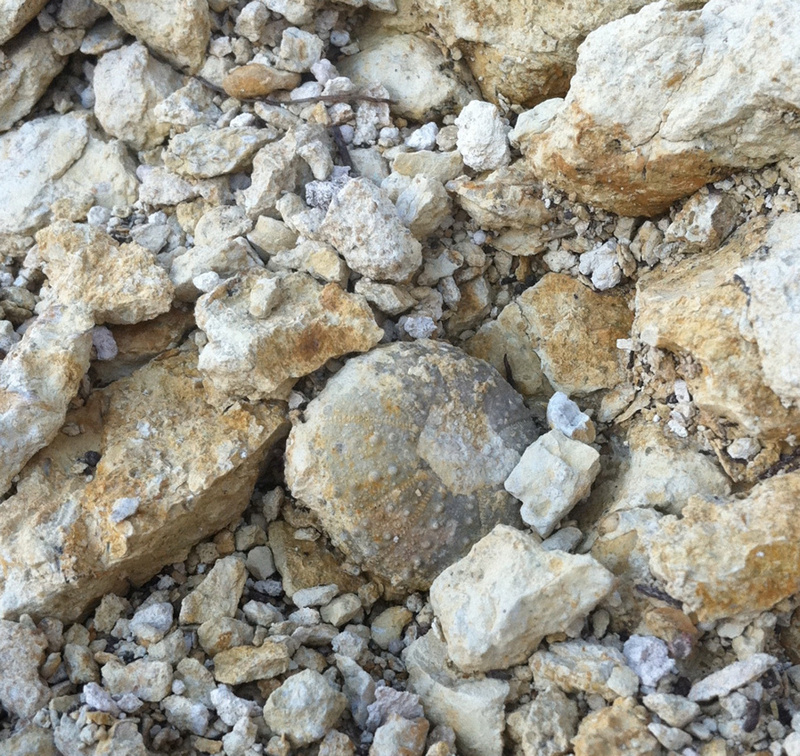 The karst topography of the Edwards Limestone lends itself to cave formation north of San Antonio. Of notable interest, Friesenhahn Cave a few miles north of Loop 1604 near Hwy 281 and Stone Oak Parkway, when excavated in the early 1950s, was found to contain the remains of several juvenile and adult Homotherium saber cats in association with numbers of juvenile mammoth teeth and other remains. Apparently that cave was used as a den for an extended period 20,000 years ago. Web searches turn up spectacular images of these well preserved cats. The Edwards is quarried extensively just to the north of Loop 1604 North as well as west of IH-35 heading north toward New Braunfels. 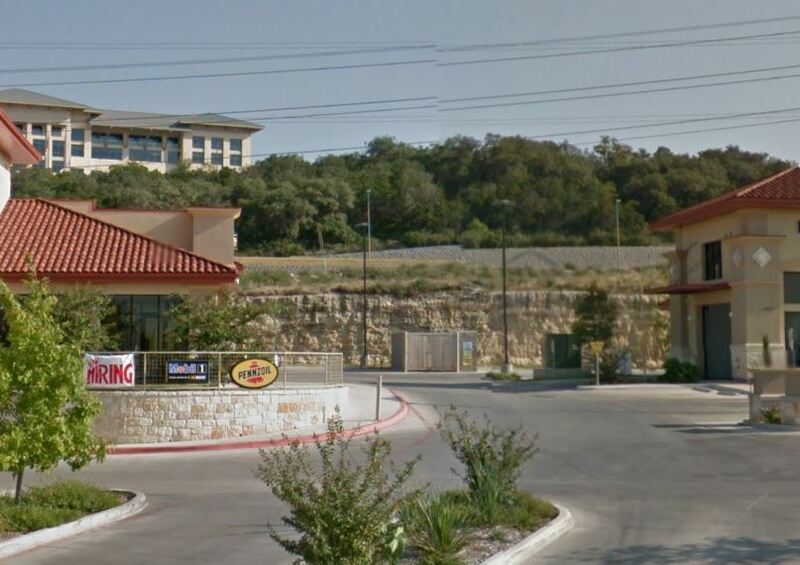 The road cuts on Loop 1604 on the north side of town between Gold Canyon Road and IH-10 afford an extensive drive-by view of the Edwards, and it also extends several miles to the north on Hwy 281, approaching within 2 miles of Cibolo Creek. 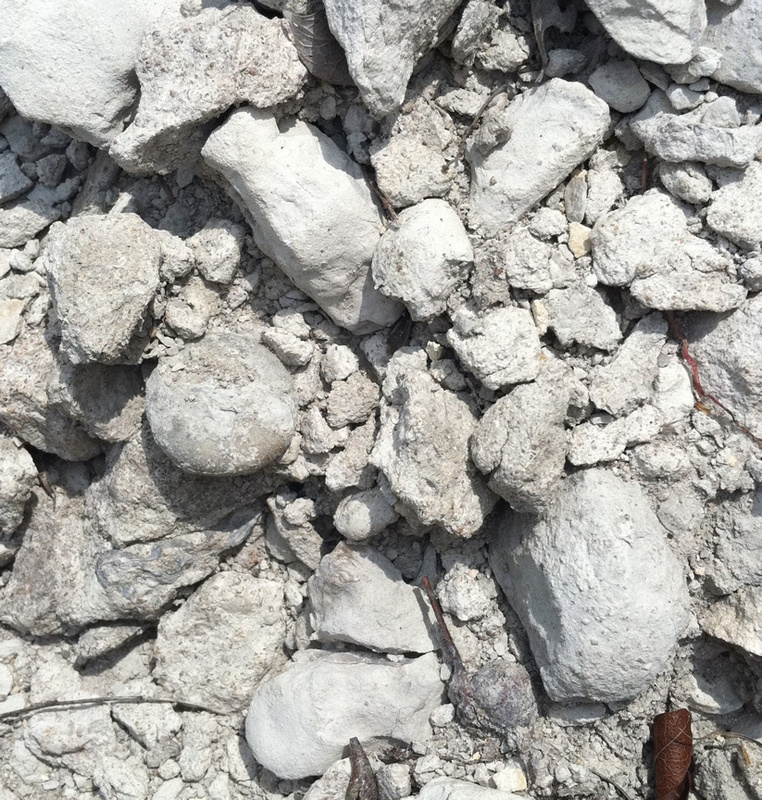 Shopping centers cut into local hills tend to leave this resistant limestone exposed without retaining walls. 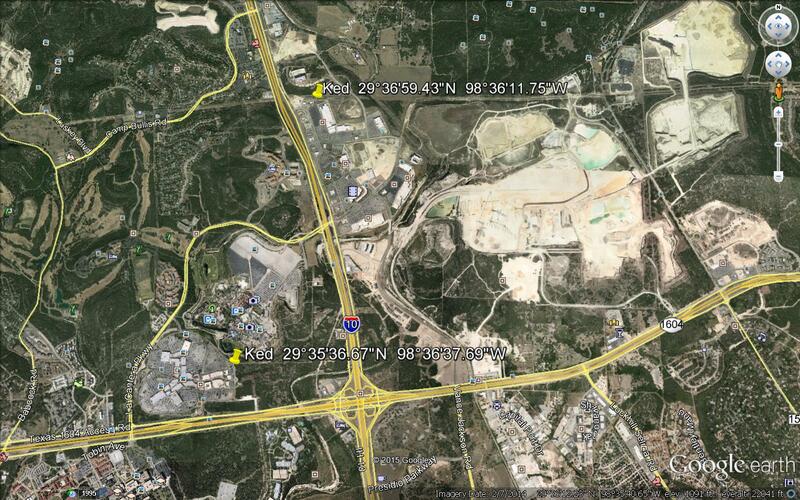 Near the intersection of Loop 1604 and IH-10, two shopping areas (The Rim and The Shops at La Cantera) are detailed in attached images to show excellent Edwards exposures affording easy access. For those seeking a greater thrill, nearby Fiesta Texas is built in a repurposed quarry in the Edwards. Generally speaking, the Edwards is a very hard limestone, grainy and crystalline in places, making it rather difficult to extract its fossils unbroken with hand tools. 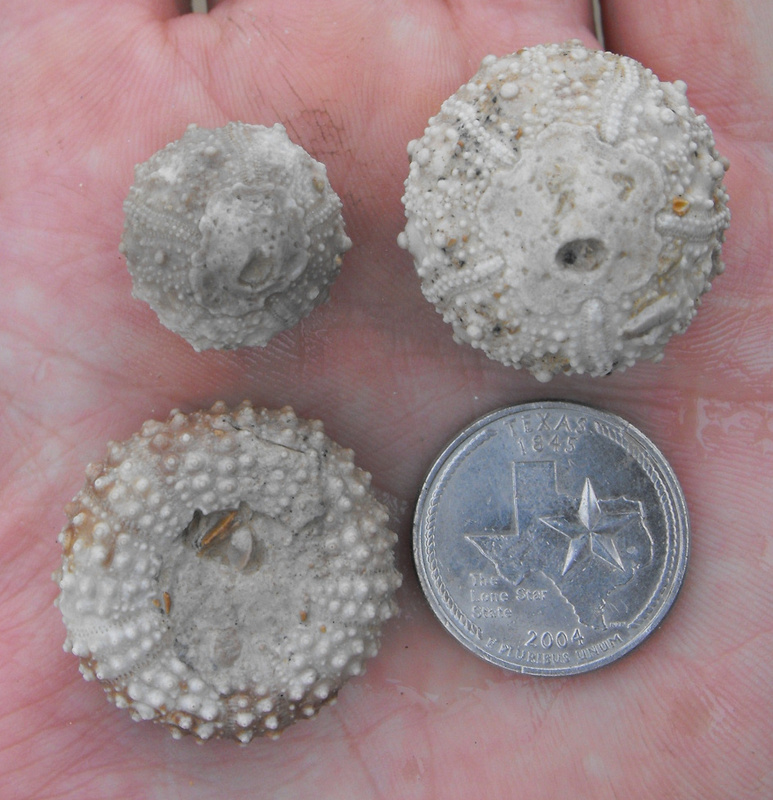 While Central and West Texas exposures of the Edwards and its equivalents are known to produce breathtakingly preserved echinoids and silicified gastropods, the San Antonio area seems to have been dealt a bad hand in terms of its Edwards fossil content, preservation, and extractability of fossils. Some of the most interesting local Edwards fossils that I've seen afield are external molds of gastropods, leaving behind cavities in the limestone festooned with elaborate surface ornamentation not seen on the steinkerns (internal molds) of gastropods so prevalent in other local formations. 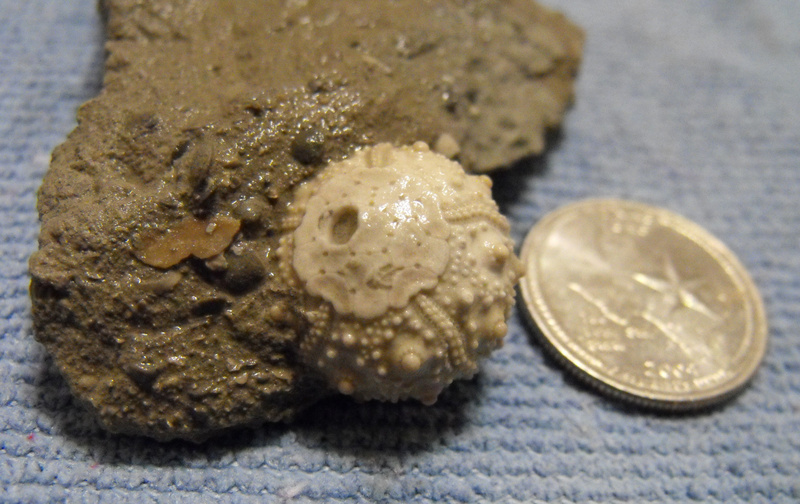 Perhaps I have not searched enough amongst the local rudist reefs for desirable echinoids, such as Goniopygus. Rudists seem to dominate the Edwards faunal spectrum. These obscure, reef building bivalves are often mistaken for a number of fossils, including dinosaur teeth. Admittedly, my time afield has been biased toward other formations, and further study would be required to give a more balanced assessment. Thickness: Sporadic exposures to 30 feet in Bexar County. Personally observed exposures only a few feet thick. 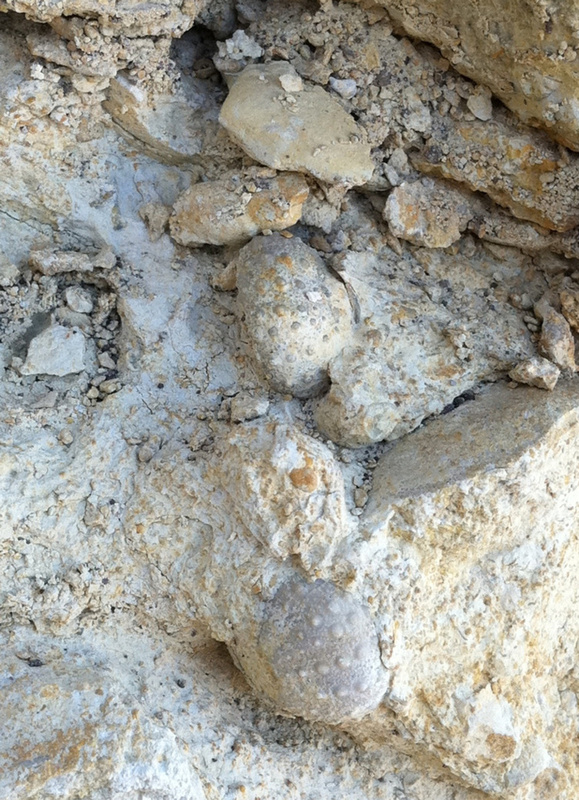 Geology: The middle and upper Albian Stage is a variably fossiliferous marine rock unit that persists along the entire Balcones Fault from NE Texas, through Fort Worth, Temple, Austin, pinches very thin over the San Marcos Arch, is very sparsely exposed around San Antonio, and reappears with greater thickness in far West Texas along the IH-10 corridor. 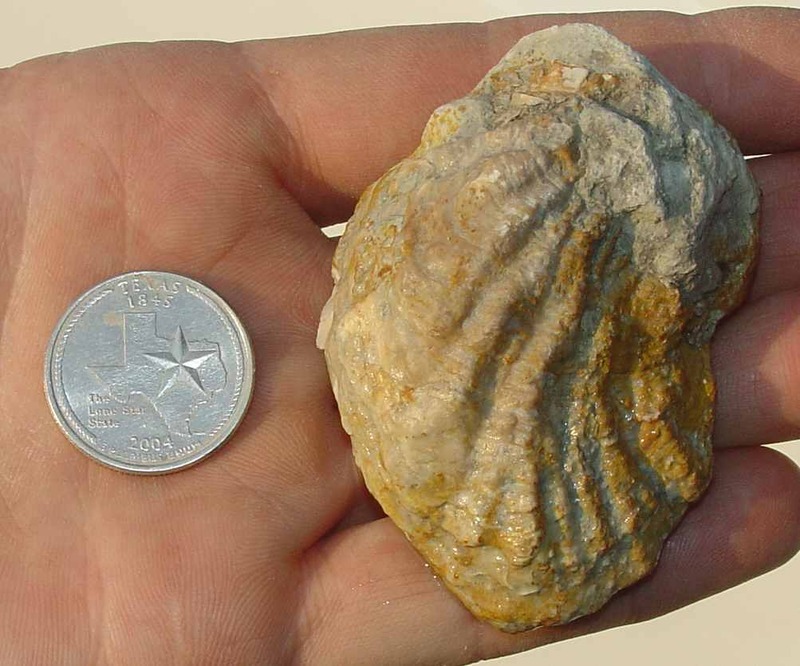 Members of the mid to upper Albian are most prominently exposed in far North Texas in the area between Lake Texoma and Fort Worth. 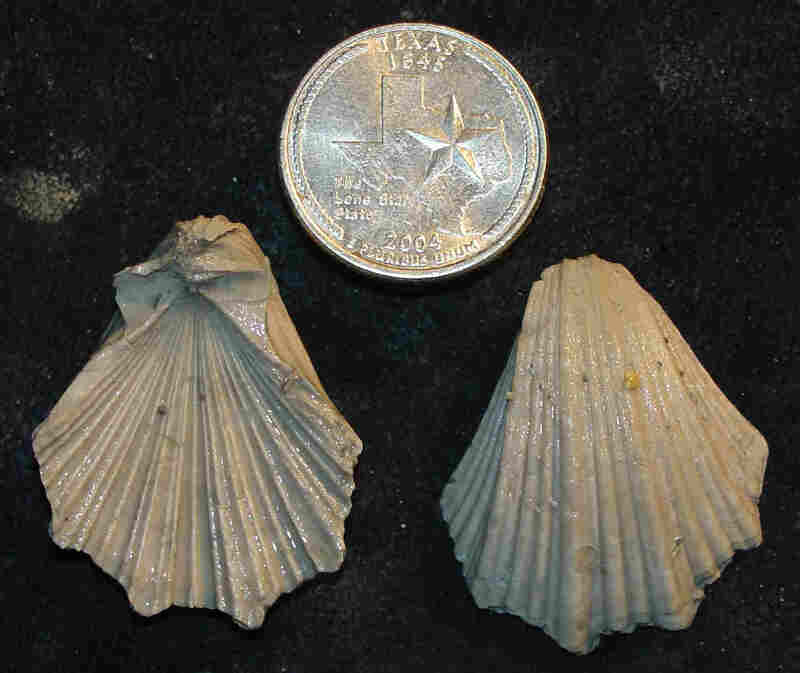 In that area, the Albian formations within the Washita Group include, from oldest to youngest, Duck Creek, Fort Worth, Denton, Weno, Pawpaw and Mainstreet. Heading southward along the Balcones Fault, all of these formations gradually thin and harden, the transition from marls and limestones to predominantly harder limestones denoting increased water depth in a classic offshore sequence. 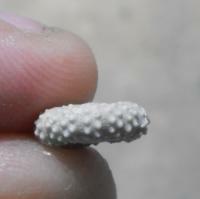 At the Brazos River, the Pawpaw becomes so thin that it pinches out and is not mapped separately southward. 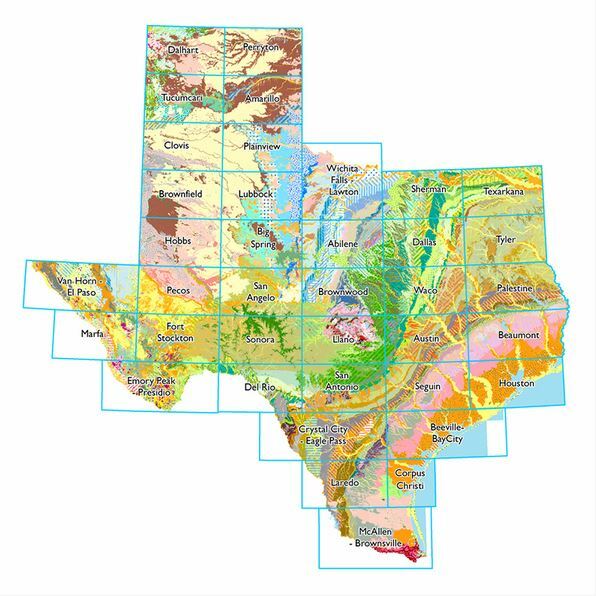 Around Belton, the remaining formations are sufficiently thin and of such narrow aerial outcrop that they are lumped together and mapped undivided as Georgetown Formation in areas farther south, with formations of the north referred to as members of the Georgetown. 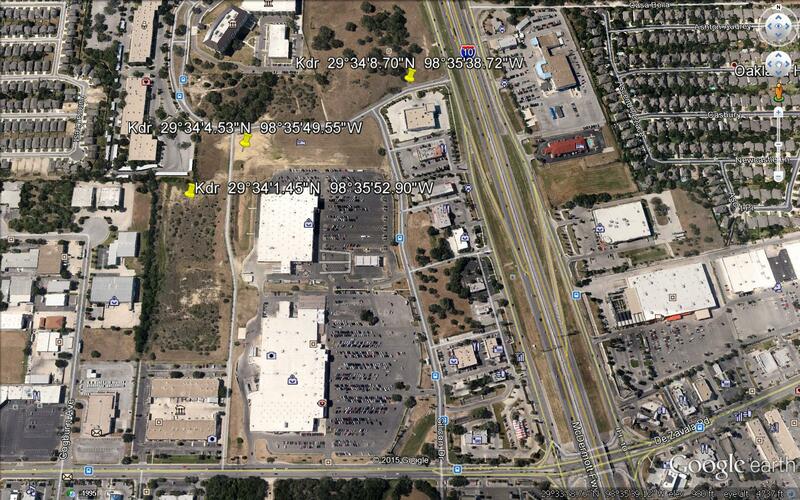 In latitudes as far south as San Marcos, the Duck Creek, Fort Worth, and Weno members have pinched out. The San Marcos area is the southernmost occurrence of Mortoniceras ammonites and Macraster echinoids encountered by the author. 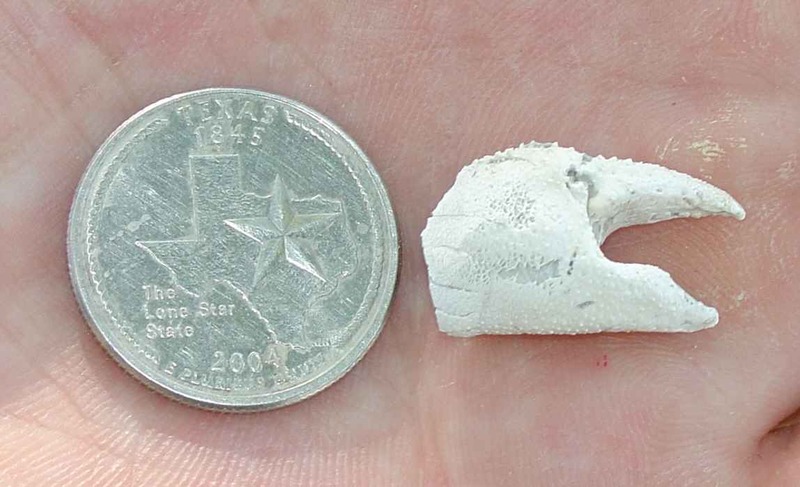 Both reappear in West Texas. Most of these lower and middle members of the Washita and their wonderful fossils are absent in the surface and subsurface in the San Antonio area. However, sparse exposures of the Mainstreet member represent the Georgetown Formation locally. 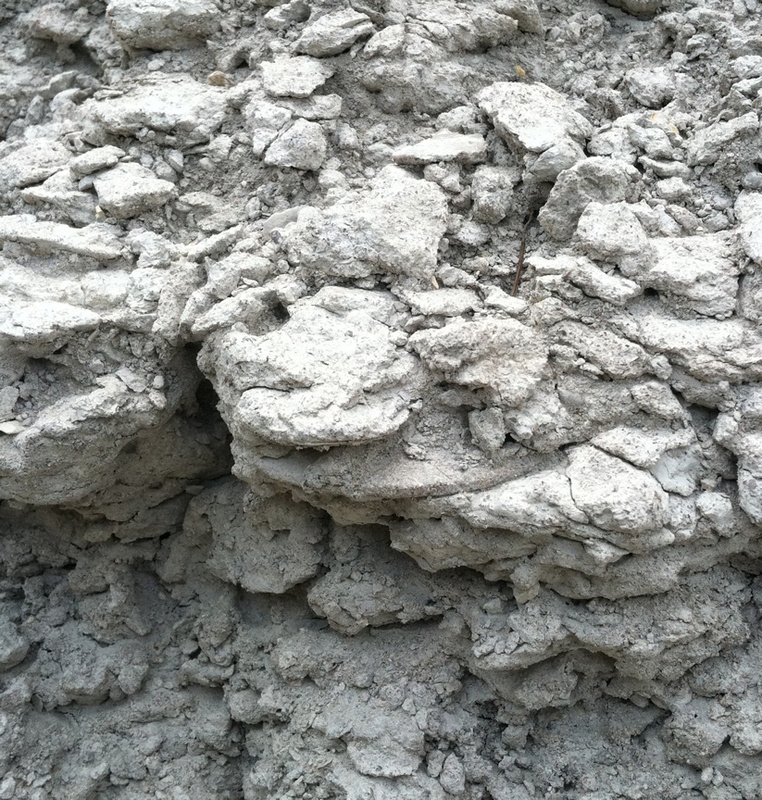 This open shelf interval occurs as a thin, tan, nodular bedded limestone disconformably overlying the Person Formation of the Edwards Group, and underlying the Del Rio Clay. 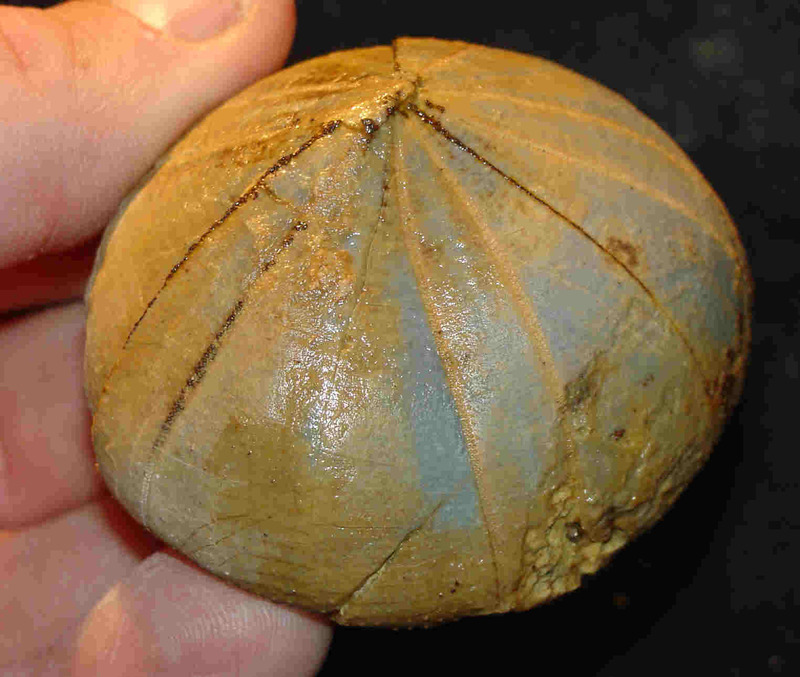 It is generally mapped undivided as an upper member of the Edwards, and is lithologically so similar near the Edwards contact that the two can be difficult to distinguish unless fossils are present. 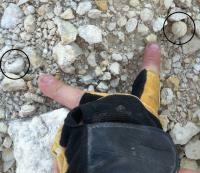 The upper contact, in contrast is characterized by a distinct and abrupt break from nodular limestone to clay. 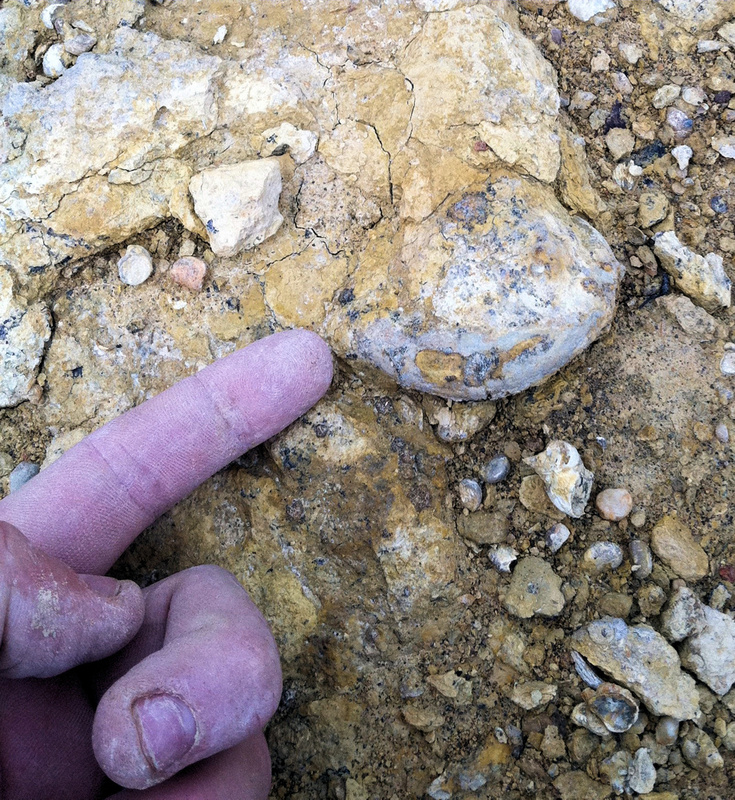 I find the Del Rio/Georgetown contact to be the most fossiliferous zone in the Georgetown of Bexar County and interestingly, this contact zone represents the contact of the Comanchean (Lower Cretaceous) and Gulfian (Upper Cretaceous) series. 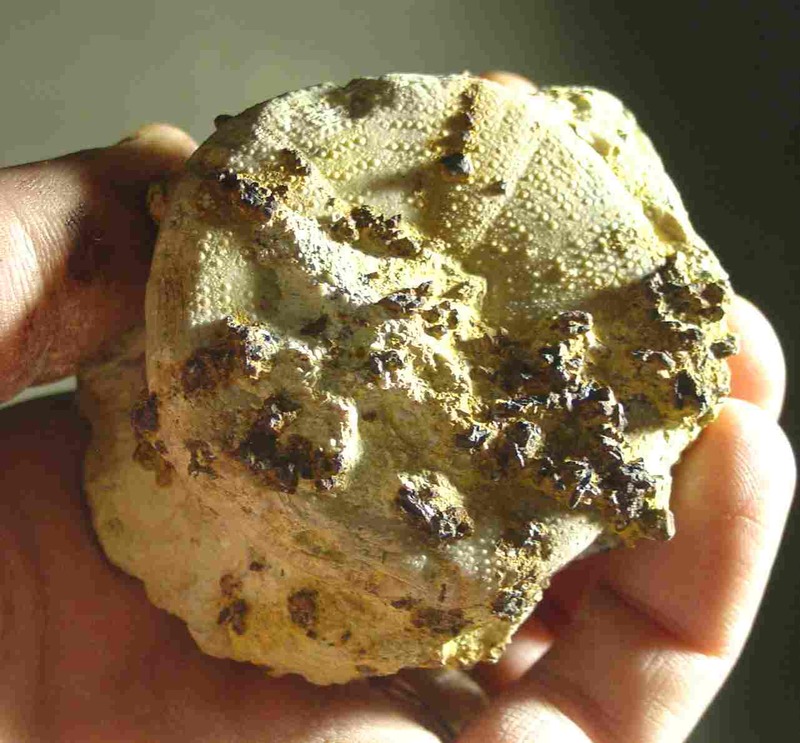 This zone is studded with rusty pyrite, which adds character when adhered to the fossils, and It is possible that much of this pyrite on Georgetown fossils is derived from intimate contact with the overlying Del Rio clay. Area Exposures: At 1:250,000 scale, the Kgt and Ked are mapped undivided in Bexar County. At 1:100,000 scale, the Kgt is mapped separately along slopes which map Person Formation at the base and Del Rio Formation above. 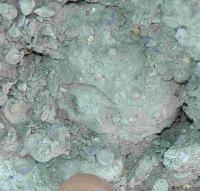 However, most of the outcrop area is covered by soil and vegetation, so mapped outcrop is inferred, and could be more intermittent than implied by the map. 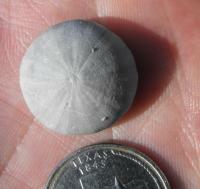 One site that exposes this unit is the bed of Leon Creek in NW Bexar County. 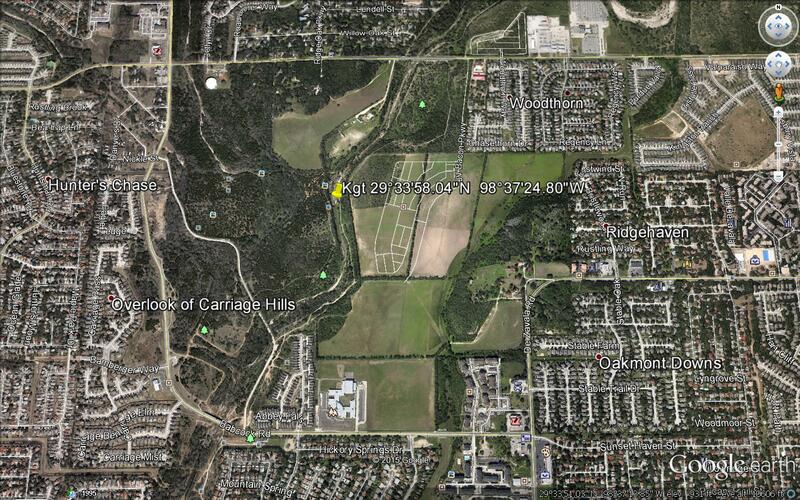 This area was recently annexed into the Leon Creek Greenway, and is therefore off limits to collecting. A Google Earth image has been included of the creek section exposing the Georgetown. The image is a bit out of date, as there is now a hike and bike bridge built over the creek, and a neighborhood just to the east. The narrow stretch of Kgt limestone is directly under this bridge and extends perhaps 50 yards upstream and downstream of it. 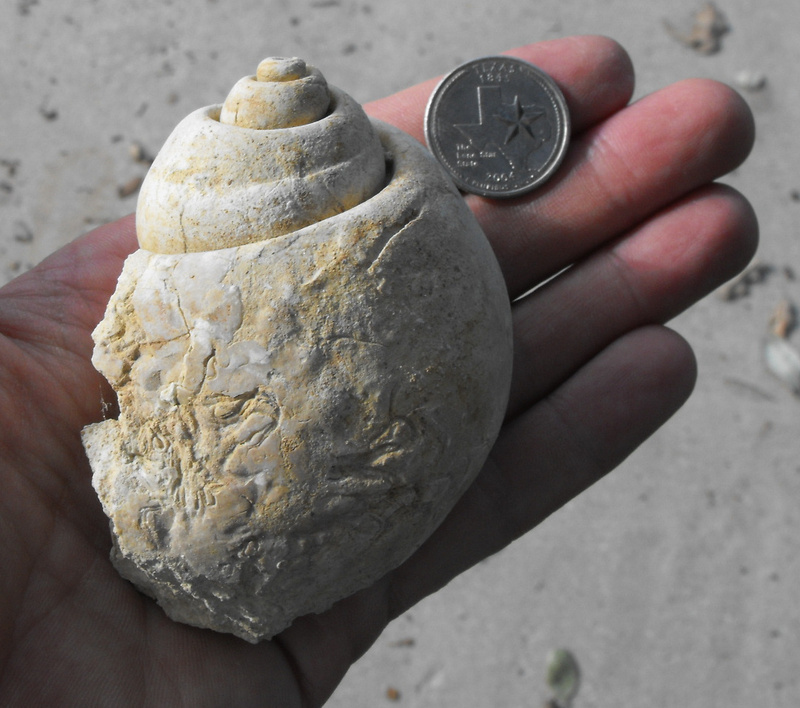 Paleontology: The local Georgetown limestone is distinguished from the Edwards by presence in the former of the small brachiopod Waconella wacoensis. 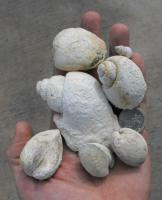 Bivalves include large Neithea (possibly N. texana) scallops and steinkerns of Protocardia clams. 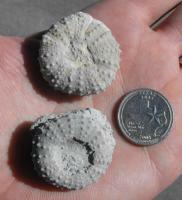 But fleeting occurrences of ammonites and echinoids provide more excitement for the adventurous collector. 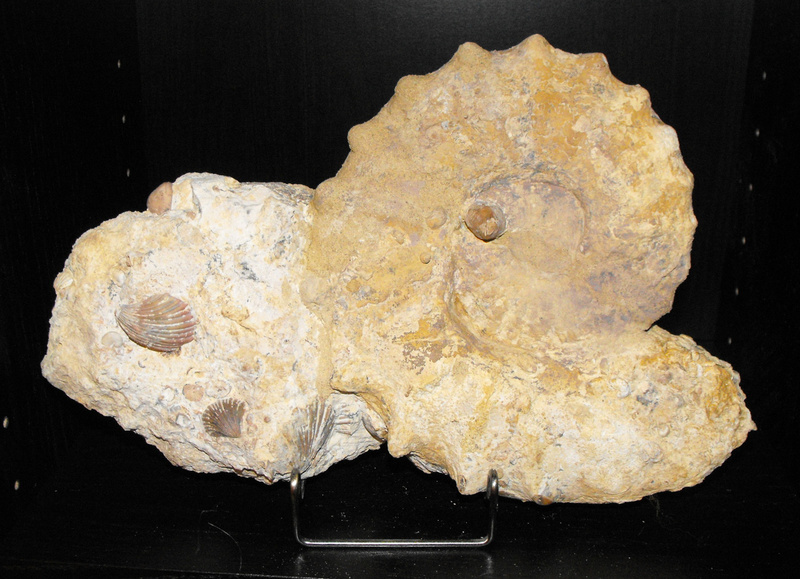 Mariella brazoensis is helically spired heteromorphic ammonite which resembles a large, ornamented gastropod. 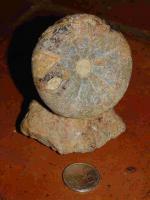 Graysonites is a rare planispiral ammonite easily identified by its prominent ventral tubercles. Paracymatoceras texanum is a coiled nautiloid occasionally encountered, and it is easily distinguished by the thin, sinuous lines on its flanks. 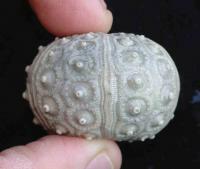 The echinoid fauna is dominated by the large, brown, dome shaped Coenholectypus, generally 1.5-2.5 inches diameter. None of these ammonites, echinoids, nor nautiloids are especially plentiful in San Antonio, so for those especially interested in finding them, a weekend trip 200-350 miles north would greatly increase odds of success. 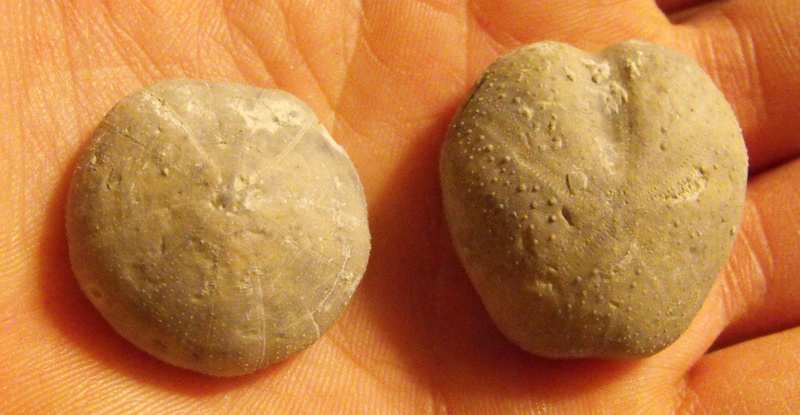 A couple decent examples of Mariella brazoensis. 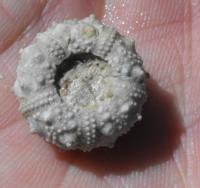 Usually found as broken, partial whorls. A rare Graysonites. This matrix presentation includes Neithea scallops and Waconella brachiopods. 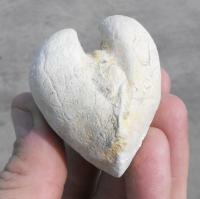 A great piece for diagnostic zonation. 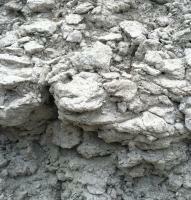 Geology: The Grayson Formation is mapped from Lake Texoma in far north Texas to the Waco area. The names Grayson and Del Rio Formations are used interchangeably between Waco and Belton. 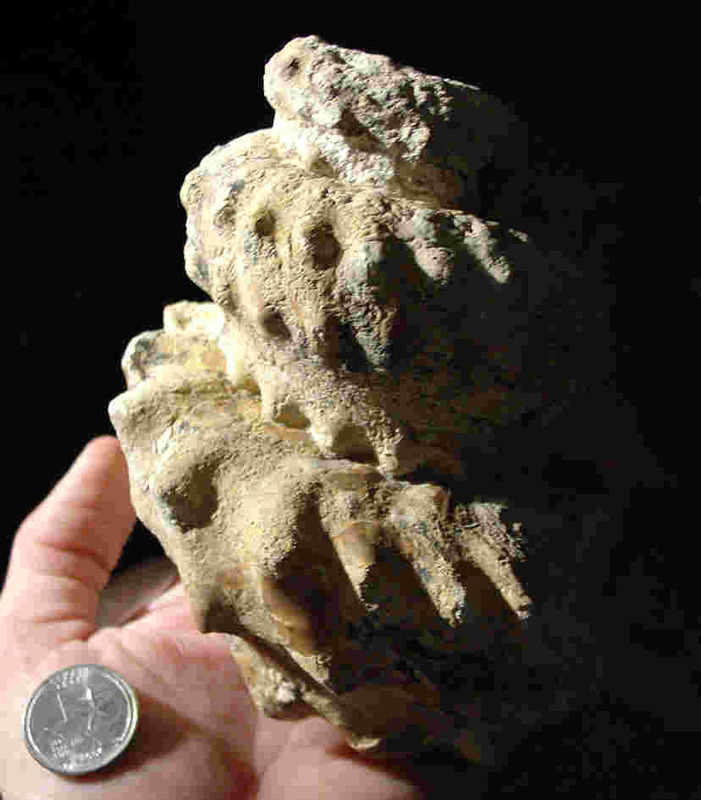 From Belton to San Antonio, through the type locality at Del Rio in Val Verde County, and on into far west Texas, it is referred to as Del Rio Formation. This interval marks the beginning of the Upper Cretaceous, and represents a shelf mud/prodelta deposit, predominantly a recessive, peanut butter colored calcareous, montmorillonitic (shrink /swell during wet/dry cycles) clay with minor amounts of mudstone. Gypsum and pyrite are common. 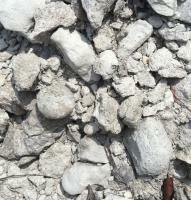 Del Rio Clay is perhaps the least permeable clay in Bexar county, so it holds water well in stock tanks etc. However, its shrink/swell nature and instability on slopes makes for shifting building foundations. Area Exposures: The soft, recessive nature of the Kdr makes for weak surface expression. It is encountered mainly on slopes capped by the more resistant Buda Limestone, as well as in valleys and flats. When excavated on hillsides during construction projects, it is quickly supported by retaining walls to prevent slumping. 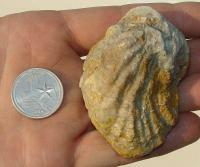 It can be viewed in the flats behind Costco and Discount Tire at the west corner of IH-10 and DeZavala Road, where I. arietina oysters are quite common. 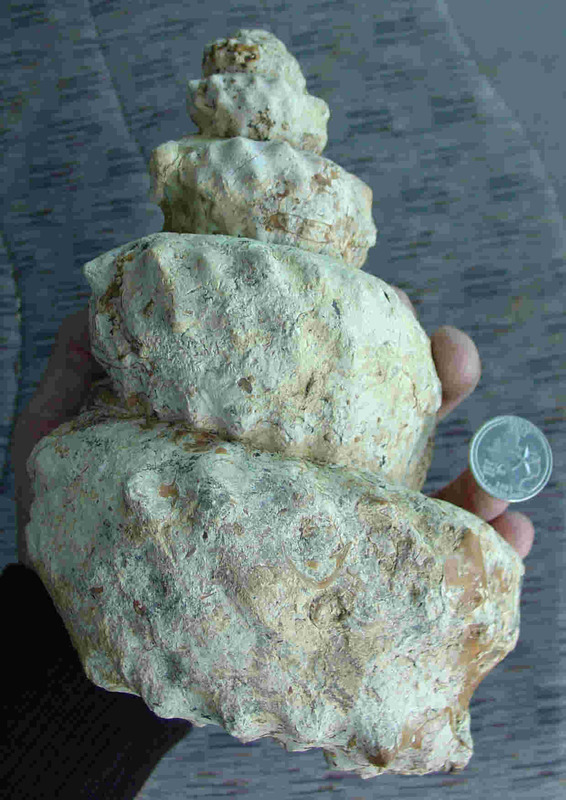 Paleontology: The index fossil of the Del Rio Formation is the ram’s horn oyster Ilymatogyra arietina, quite common in the lower 2/3 of the formation. Less abundant is the oyster Gryphea mucronata, which seems to have the strongest presence in the upper 1/3 of the formation locally. 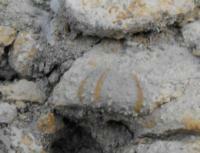 These oysters persist in great numbers through the entire outcrop area noted in the Geology section. 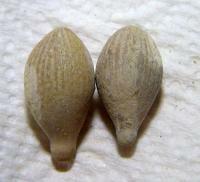 The brachiopod Waconella wacoensis, abundant in the Kgt, has phased out by the end of the Albian. 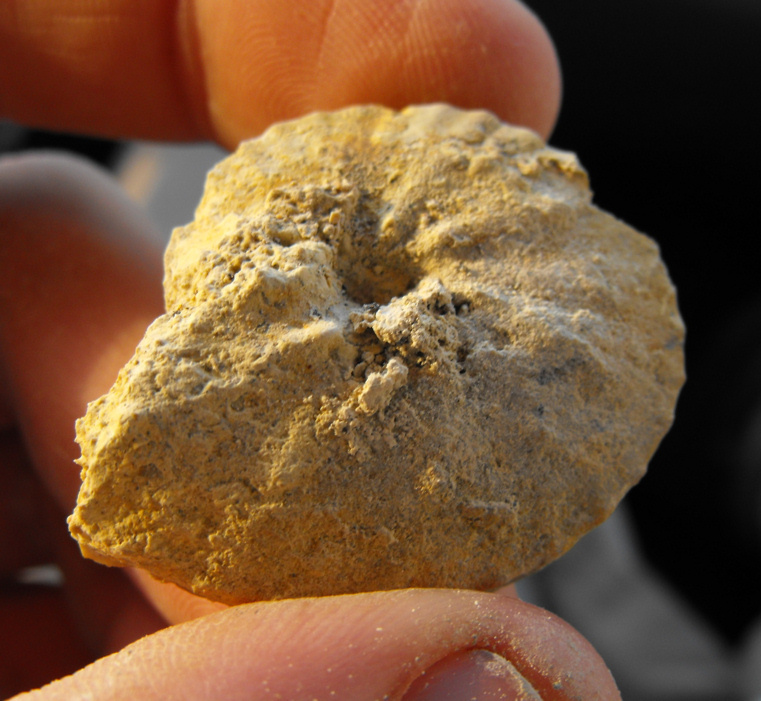 San Antonio Del Rio exposures lack the extensive micromorphic ammonite fauna noted in the Waco area. I have encountered one or two spatangoids in the Del Rio, either Heteraster or Washitaster, too poorly preserved to key out with confidence. 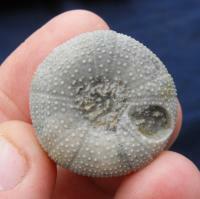 A few Palhemiaster calvini echinoids have also been found locally.